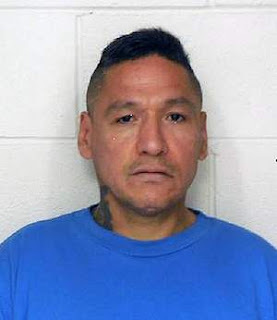 48 years old - 5' 8"
Pahtayken was living at the Salvation Army's New Hope Centre in downtown Nanaimo since mid-August and is wanted for breaching his parole conditions. He has not returned to the Centre since Monday and is believed to still be in the Nanaimo area. Police say he has an extensive criminal background for violence related offences and can be unpredictable is using illicit drugs. He should not be approached. Pahtayken is First Nations, medium build, 5' 8" tall, short brown hair and brown eyes. He has a scar below his right eye, a surgical scar on his stomach and gang tatoos on his stomach. He also has a tatoo of a rose, a wizard on his arm, a head tatooed on his neck and a dragon and castle on his other arm. If you have information on Pahtayken's whereabouts, please call the Nanaimo RCMP at 250-754-2345 or contact Crime Stoppers at 1-800-222-8477, text 274637 with keyword Nanaimo, or online atwww.nanaimocrimestoppers.com.